March 29, 2013 Gobekli Tepe 8 miles northeast of Sanliurfa, Turkey - Even though Gobekli Tepe is carbon dated to 12,000 years ago, there is one excavated stone pillar that has what looks like a bird with outstretched wings and a circular object that provokes comparison to the shen symbol of Egypt seven thousand years later. 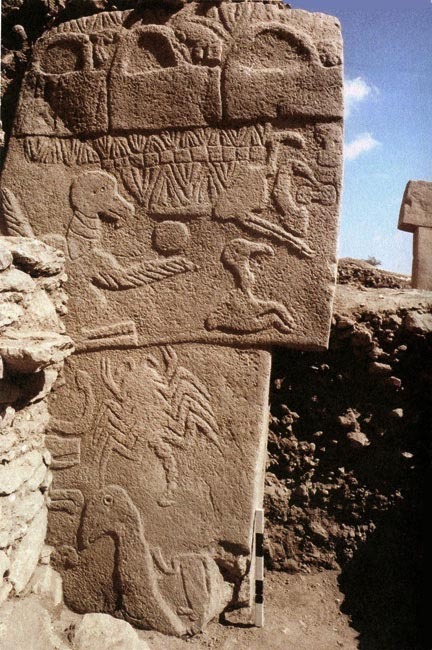 Gobekli Tepe excavation. Photo by Klaus Schmidt, Ph.D.
Next PostNext Part 1: 12,000-Year-Old Gobekli Tepe – Is It Linked to the Star Deneb in the Cygnus Constellation?